Newcomer growth - 600 people try DanceSport in April! 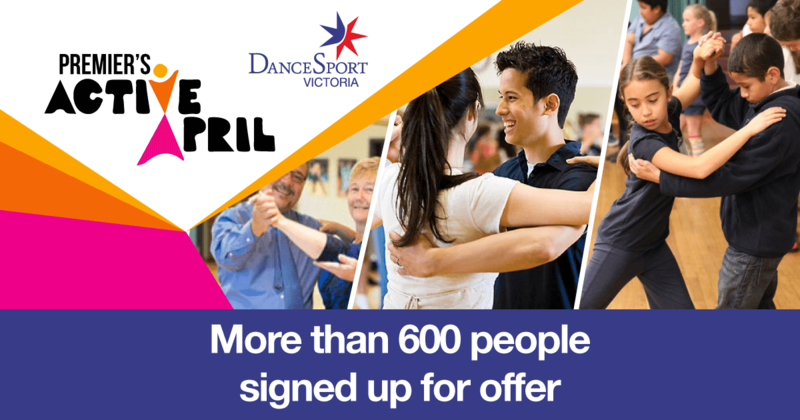 Over 600 Victorians have participated in DanceSport thanks to the State Government's annual Active in April campaign. This has been DSV's single most successful publicity campaign. This is the second consecutive year that DSV has promoted our sport. Fifty to 100 participants took part last year. The annual Premier's Active April (PAA) campaign offers a variety of free activities, including tennis, yoga and DanceSport, to encourage Victorians to be healthier. We can see lots of benefit for our members to join the PAA campaign to get fitter. PAA gives strong exposure to sports too, so after noticing the possibilities in 2017, DSV signed up as a major partner this year. The RTFs (studios) that joined received free, good-quality promotional material, including advertising through the PAA site. Being a major partner means we had a higher profile in the campaign. Check us out here. Excited participants turned up to studios and enjoyed five free group lessons during April.DSV funded prizes, including dancing shoes or lessons, for a raffle, which was a hit with the RTFs.MarShere Studios have become a RTF with DSV, which is exciting for DanceSport's future. Forty-three studios joined in and the campaign generated 600 enquiries. Even better, there have been substantial numbers returning for further lessons. DSV is thrilled to see the increase from 50-100 in 2017 to 600 in 2018. Geoff Vine, DSA Chairman of Marketing and Communication, said, "The number of people taking up the offer exceeded all expectations. It shows what can happen when our industry joins together to promote itself." The overall PAA campaign attracted over 120,594 Victorians across all activities. Next year we plan to run the promotion Australia-wide. We are committed to growing DanceSport. We welcome your support. Please promote Active April to your friends and family.